For other uses, see Pendant (disambiguation). Not to be confused with pendent, Pennant (disambiguation), or pedant. This article is about the piece of jewellery. For person who is excessively concerned with formalism and precision, see pedant. Spanish pendant at Victoria and Albert Museum. 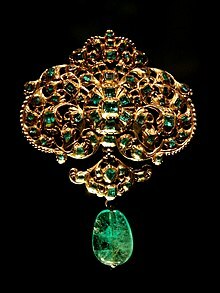 The word pendant derives from the Latin word pendere and Old French word pendr, both of which translate to "to hang down". It comes in the form of a loose-hanging piece of jewellery, generally attached by a small loop to a necklace, which may be known as a "pendant necklace". A pendant earring is an earring with a piece hanging down. In modern French, pendant is the gerund form of pendre (" to hang") and also means "during". The extent to which the design of a pendant can be incorporated into an overall necklace makes it not always accurate to treat them as separate items. In some cases, though, the separation between necklace and pendant is far clearer. Carved agarwood imperial pendant, Qing dynasty, China. Adilnor Collection, Sweden. Pendants are among the oldest recorded types of bodily adornment. Stone, shell, pottery, and more perishable materials were used. Ancient Egyptians commonly wore pendants, some shaped like hieroglyphs. The many specialized types of pendants include lockets which open, often to reveal an image, and pendilia, which hang from larger objects of metalwork. Throughout the ages, pendants have come in a variety of forms to serve a variety of purposes. Though amulets come in many forms, a wearable amulet worn around the neck or on the arm or leg in the form of a pendant is the most common. These are objects believed to possess magical or spiritual power to protect the wearer from danger or dispel evil influences. Similar to an amulet, a talisman is an object believed to possess supernatural traits. However, while an amulet is strictly a defensive object, a talisman is meant to confer special benefits or powers upon the wearer. A locket is a small object that opens to reveal a space which serves to hold a small object, usually a photograph or a curl of hair. They typically come in the form of a pendant hanging from a necklace, though they will occasionally be hung from a charm bracelet. A medallion is most often a coin-shaped piece of metal worn as a pendant around the neck or pinned onto clothing. These are generally granted as awards, recognitions, or religious blessings. Pendant is the name given to one of two paintings conceived as a pair. Traveller's sundial pendant (a portable form of astronomical rings) used to tell time from the sun. Tools worn as pendants include Maori pounamu pendants. Shepherd's whistles, bosun's whistles, and ocarinas can also be made as pendants. 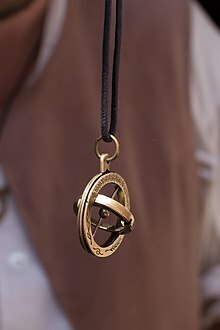 Portable astronomical and navigational instruments were made as pendants. In the first decade of the 21st century, jewellers started to incorporate USB flash drives into pendants. Wikimedia Commons has media related to Pendants. ^ "The Early Pendant: A Jewelry And A Talisman". Talismanamulet.org. Retrieved 7 August 2012. ^ a b Johns, Catherine (1996). The Jewellery of Roman Britain Celtic and classical Traditions. Routledge. p. 104. ISBN 9780415516129. ^ "amulet". The Columbia Encyclopedia (6th ed.). Encyclopedia.com. 2014. Retrieved 27 October 2014. ^ "Talisman". Encyclopedia of Occultism and Parapsychology. Encyclopedia.com. 2001. Retrieved 27 October 2014. ^ Luscomb, Sally. The Collector's Encyclopedia of Buttons. Atglen, PA: Schiffer. p. 242. ISBN 0-7643-1815-2. ^ "Medal". The Columbia Encyclopedia. Encyclopedia.com. 2014. Retrieved 27 October 2014. ^ Yamamoto, Mike (1 February 2007). "USB as fashion statement". CNet. Retrieved 3 October 2013. ^ Yamamoto, Mike (11 June 2007). "The hot trend in designer jewelry: USB keys". CNet. Retrieved 3 October 2013.